And this will probably lead right into the events Mia saw in her second dream. Yes, but what leads to Mia getting a haircut? Is Rhen trying to disguise her as a boy? And of course, she’s gone home, so she has to spend some time there. It’s been a while since we’ve seen Earth. Mia getting a haircut? Dream? What are you guys talking about? I really do NOT like these people….! Then that means they are good villains. Can I get a triple Dun-Dun-DUNNNNNN? Elaina, Then and Mia in these guys crosshairs? Triple danger for the crew of the True North! Just to be sure, now we will have to pay to be able to see the comic in color? Or is it just that you don’t have the time to do the coloring at the moment? The latter, I’m afraid. I’m busy playing catch up, freelance and some other stuff. The Patreon is pretty much defunct for now — I’ve already contacted backers about that. We might return to some sort of crowdfunding option at some point, but for right now we’re not going to pursue it. We’re technically still “on hiatus” and I’ve only posted pages of Chapter 11 because our “birthday” was in late August. I prefer it to be the latter, no prob with that. Cheer up! What? I was wondering where all the Patreon links on this page went. Sorry it didn’t work out. Not enough supporters? Oh no, that wasn’t the issue. We didn’t have the campaign up long enough to be able to determine whether or not we’d have enough supporters. There’s stuff going on behind the scenes with Shadowbinders that we can’t really elaborate on right now. But for now, something like Patreon might not be the best course of action for us. What’s up with these tribe legends? And why/how can Mia be a mage? Only direct and first born decendents can be mages, and the ring came from her grandfather so the ‘same gender’ thing is out to. Maybe magic works differently on earth, like time does. Only time moves differently in both worlds, and the amount of time passing is never the same, whereas this would have rules or something. Time seems to move at an 14:1 ratio Belatyr:Earth (from Chapter 3, Page 40). So for every generation that passes, approximately 14 pass on Belatyr. Because of how little information we have about her family’s past, it would be premature to assume that Mia is not descended from mages. In fact it seems almost certain given the existence of the book about Belatyr. However, I doubt that Mia’s mother has ever been to Belatyr, which leaves either the grandmother, or perhaps a great-grandmother. This would mean that if Mia is descended from Mages, her bloodline has been out of Belatyr for 28 to 42 generations (about 420 – 756 years depending upon the average age parents have their first child). This could also be different if the amount of time flow was different at different times. Of course another option is that she is not descended from mages and that the ring simply grants its wearer magical powers. This is possible, though I would like to know how her family came to have the ring, and if the ring was made specifically for them. 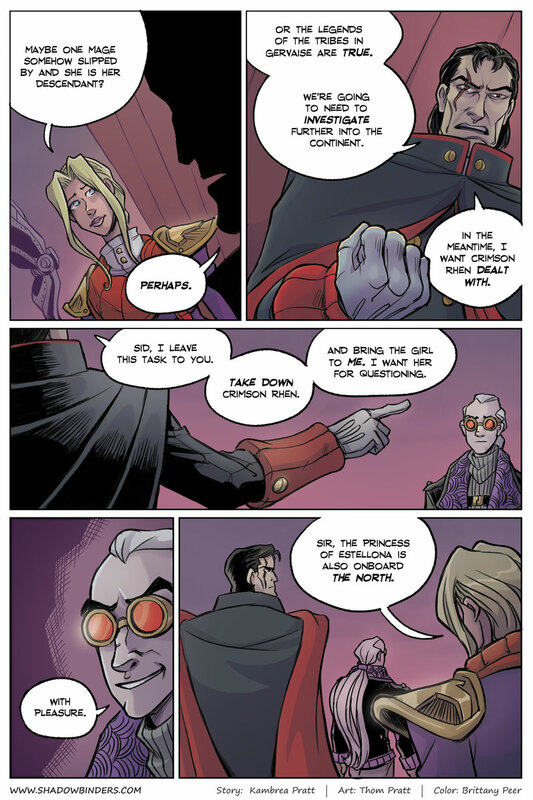 This is a comic about magic and steampunk technologies though, so I should probably stop reading into it. Just discovered this comic and am sad that you are not actively updating it. You are probably busy, but this potential fan would like you to make more comics. Also, awesome comic. The artwork is interesting and the story is also. Nice line art and shading. Awful color palate.